Sixth grade students worked with Mr. West to explore conflict management and resolution during P.E. this spring as part of Project Peace, and the results included a powerful visual reminder of important strategies for dealing with conflict. The Powerful Peace Wheel Poster that resulted was originally titled the Choose Act Reflect Wheel and was designed and created by Carl Sanchez at the Alicia Sanchez International School in Colorado. 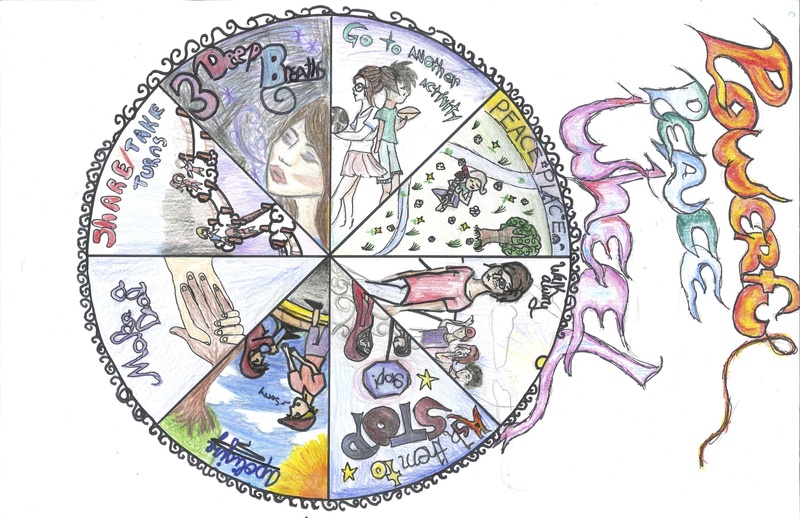 Sixth graders ultimately recreated their own peace wheel with original drawings by Sumayah Chapelle, Anabelle Edwards, Rayna Kraus, Charlotte Niebering, and Lilly Hudson and used the Powerful Peace Wheel as a teaching tool with classes throughout the school to talk about conflict resolution. Strategies depicted on the wheel include: Walk Away; Ask Them to Stop; Apologize; Make a Deal; Share/Take Turns; 3 Deep Breaths; Go to Another Activity; and Peace Place. The Peace Place is utilized as a quiet safe space for reflection individually or serves as a spot reserved for communication between two people dealing with a conflict. Listen to sixth graders’ perspective on designing the Powerful Peace Wheel in the video below.